This is my go-to, in-a-pinch dessert because it is so fast and easy—and always so well received. Prep takes about five minutes. The base recipe is just two ingredients…but you can get as creative as your taste buds allow. 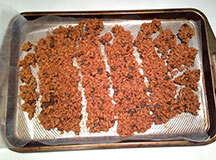 The first base ingredient is chips—I used dark chocolate chips and peanut butter chips in the two recipes below, but if you’re not cane-sugar-restricted as I am, you can use milk chocolate, white chocolate, butterscotch, or any other flavor that you like(I just noticed pumpkin spice chips on the Nestle web site!). You can also use a bar of baking chocolate, but chips will melt faster. The rest is all mix-ins. You may have seen “chocolate haystack” recipes that start out like mine—melt chocolate, mix in yummy stuff. 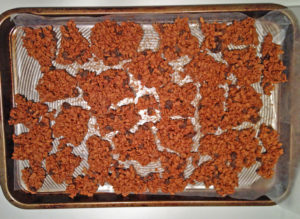 My way is faster because instead of forming the mixture into individual servings, I make one big sheet of it like a bark and, once hardened, break it into individual pieces. Measurements are estimates. Each recipe here will almost fill a cookie tray. The number of servings is hard to say—once you start eating these crunchy delights, it’s hard to stop! 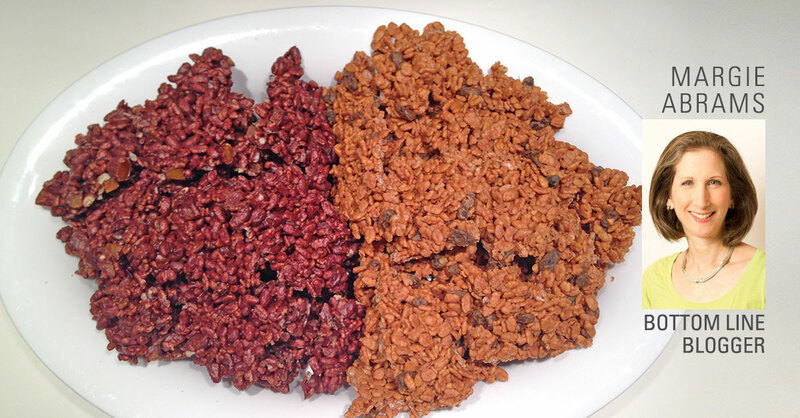 Due to family preferences, I made these without nuts…but nuts are a delicious, nutritious mix-in, and I have included suggestions below. Any real chef will tell you to melt chocolate over a double-boiler on the stove so that you don’t burn the chocolate. Microwaving is so much faster, and has always turned out well for me. Cover a cookie sheet with waxed paper or parchment paper. Put chips into a large, microwave-safe mixing bowl and microwave on high for one minute. Stir, then microwave for another 30 seconds. Stir again. That’s usually all it takes for my coconut-sugar-sweetened chips (which I buy from Davis Chocolates), but it may take longer for “conventional” chips. Just keep additional melting times short so you can monitor the progress. Hint: Chop the apricots while the chips are in the microwave. Pour in crisp rice and nuts and give it a few gentle stirs. Add apricots (sprinkle in by hand to help keep the pieces from sticking together) and stir until fully coated and apricots and nuts are spread evenly throughout the mixture. 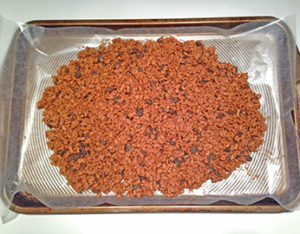 Gently spread mixture onto the cookie sheet, making it as thin as you can without leaving holes. Put into the refrigerator to harden. Hint: I usually make this at night, and let it harden overnight. But when I’m in a hurry, I’ll put it into the freezer instead. I’m not sure how fast it hardens, but certainly within half an hour and probably sooner. Break into pieces to serve. I usually make columns, and then break those into the individual pieces. If you’re using sliced almonds, toasting adds so much flavor. You can do it in a toaster oven—literally just put them onto a tray and toast, keeping an eye on them so they don’t burn. Or toast in a dry pan on the stove on medium-high heat, stirring constantly until almonds are lightly browned, which usually takes only a few minutes. Hint: If I’m going through the trouble of toasting almonds, I always toast the entire bag and then store the excess in the refrigerator. They’re delicious with chopped apples (plus a shake of cinnamon) or mixed into oatmeal or a green salad. Put chips into a large, microwave-safe mixing bowl and microwave on high for one minute. Stir, then microwave for another 30 seconds. Stir again. As I said above, that’s usually all it takes for my chips, but it may take longer for the chips you use. Just keep additional melting times short so you can monitor the progress. Pour in crisp rice and almonds and give it a few gentle stirs. Add raisins and continue to stir until fully coated and raisins and nuts are spread evenly throughout the mixture. Put into the refrigerator to harden for a few hours or into the freezer to harden within half an hour. Break into pieces to serve, first making columns and then breaking those into individual pieces. Sprinkle in some cinnamon or cardamom for a more exotic flavor. Add a ½ to 1 teaspoon of an extract—such as vanilla, almond, coffee or orange, even mint (eliminate the fruit if you use mint, and I don’t recommend mint with peanut butter or butterscotch). Add ¼ cup peanut butter or almond butter to the melted chips before adding the rest of the mix-ins. You may need a bit more rice and/or other mix-in. Add some unsweetened shredded coconut (this, too, is even more delicious when toasted)—replace some of the rice or fruit, or simply use more chips.